12m long manuscript penned in the Bastille, stolen in 1982, smuggled into Switzerland, and ruled a good faith purchase in 1998. The Swiss Collector stories are coming fast these days! 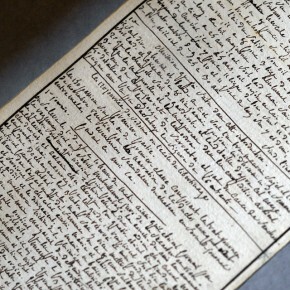 The AFP is reporting that the original manuscript of the Marquis de Sade’s Les 120 journées de Sodome ou l’école du libertinage (‘The 120 Days of Sodom’) is returning to France and going on display in a private museum run by the manuscript owner, Gérard Lhéritier. Lhéritier has also indicated that he would like to keep the manuscript for five more years (presumably making bank on museum visitors), then donate it to the national library. He says that the government has not responded. The manuscript really does have a sordid history. It is a 12-metre long scroll that de Sade wrote while imprisoned in the Bastille. He pumped this one out in a 37 day binge in 1785. When the Bastille was stormed in 1789, de Sade assumed that this scroll was gone and claimed to have ‘wept tears of blood’. But no! It wasn’t snagged by the Bastille stormers and was found safely hidden where de Sade had stashed it. It apparently changed hands quite a few times, until it reached a German psychiatrist named Iwan Bloch who had it published for the first time in 1904. By 1929 it was owned by the husband of one of de Sade’s direct descendants, Marie-Laure de Noailles and her husband Viscount Charles de Noailles. They left it to their daughter Natalie who kept it in a drawer. Natalie de Noailles gave the scroll to a man named Jean Grouet for safekeeping at some point. Grouet stole the manuscript and smuggled it into Switzerland in 1982. He then sold it to Gérard Nordmann, a collector for erotica, for $60,000. Understandably de Noailles was not so into this and she filed suit for the return of the scroll. A French court agreed and in 1990 ordered the manuscript’s return. But Switzerland doesn’t roll like that. Or scroll. Switzerland doesn’t scroll like that. They were not signatories to the 1970 UNESCO convention back then and de Noailles was forced to push things through Swiss courts as well. In 1998 a Swiss court ruled that Nordmann purchased the manuscript in good faith and, thus, de Noailles had no right to it. Apparently Nordmann passed, as did de Noailles, leaving their argument to their heirs. In 2012, the Nordmann estate tried to sell the manuscript to a French collector but de Noailles’ son blocked the sale, noting that his mother wanted the manuscript to go to the Bibliothèque Nationale. As of last year, the Bibliothèque Nationale was meant to be negotiating with all sides to purchase the piece. It seems as though the sale to the French collector (Gérard Lhéritier?) went though, but that the Bibliothèque Nationale is not involved, at least not yet. It will be interesting to see where this all goes. Lhéritier apparently paid €7m for it. He clearly thinks he will recoup his investment. This is a good illustration of why the ‘Anonymous Collector’ of cultural property has historically been Swiss. Switzerland has gotten quite a bit better, but they are known for lax laws regarding the acquisition of cultural property and, especially, this strong sense of ‘good faith’ as being an acceptable excuse for purchasing stolen goods.